Well I am late in posting here but I did make this card for the PCP sketch challenge on 11/29/08. I actually made 2 of them using the same stamps but different papers and colors but the other picture turned out too blurry! I seem to be having issue with that lately so will have to work on a better place to take the photo's and steadying my hand for the actual snap! Anyway this was made using some scraps I got in a trade at Swap-Bot and images from an image swap there also. I added some colored bling to the side and walah! Snow Couple LOL! Enjoy! Have a great day - it is grey and cold here today - I am praying the sun to peek out but I don't know if that will happen or not. Wow! You have some great cards. Nice blog! Thanks for the link. I love your blog swap 4! Your cards are great! I heart snowmen! This is one craft that I have not gotten into, yet. I bead, silversmith, make glass beads, knit like crazy, but never any paper crafts. Looking at your snowmen is inspiring me to maybe make one of my own! 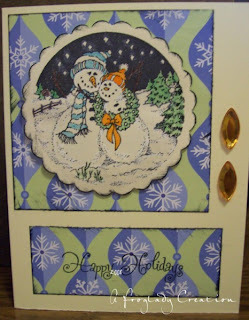 I am loving this card also so wintery but fun aswell!!! Ohhh FABULOUS card. Love the DP! Beautiful stamp too!